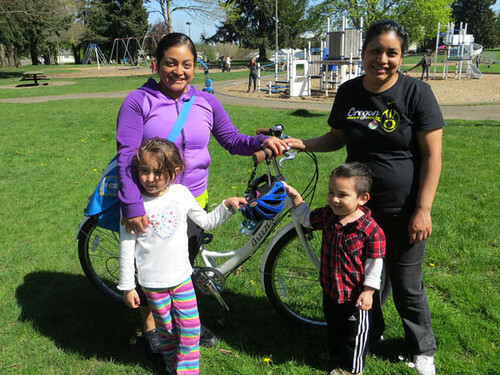 This April, Community Cycling Center follows up with Maria on a sunny day in the Kenton neighborhood to learn how the lessons from the workshop and having a bike have helped her. 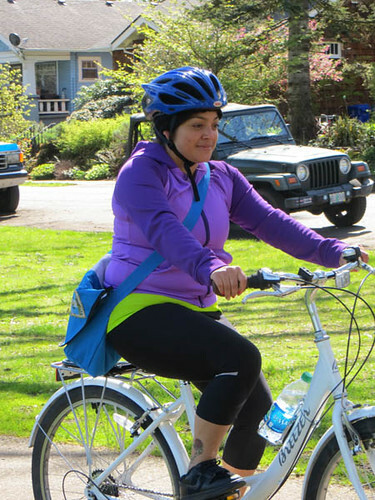 “This bike is my first transportation,” Maria says sitting up straight and smiling. “I ride my bike every day, from my house to my job, the grocery store, even church on Sundays. In my culture, in Guatemala where I come from, people ride bikes for fun, but they don’t think you can use a bike for transportation. When people see me ride to church, they’re surprised to see me on a bike, and then they want to ride a bike, too. I’m showing them that a bike can be used for transportation. “My bike is good for health, too. From my house to my job is about five miles – morning and going back, that’s 10 miles a day. It’s a good workout. “Another really important thing I learned is keeping your bike locked really good. Secure. And different ways to lock your bike. I also learned to fix a tire, but so far, no flats! “Since I took the workshop, I feel safe. I follow the bicycle route on the road. I learned things you have to do to be safe. Back when I had my other bike, I was a little nervous to ride it in the street. I just rode it on the sidewalk. I always wear my helmet even to go somewhere little, like down the street. It’s good, protects my head. 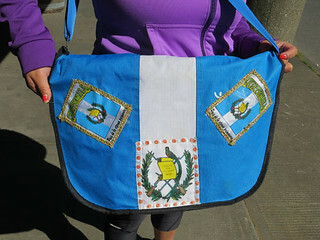 Maria shows me her blue Timbuktu shoulder bag with a white stripe down the center, like Guatemala’s flag. “I got this bag at the resale store down the street. It’s good, waterproof, and not expensive. I made this,” she says with a big smile, pointing to the detailed patches decorating the outside of it. “When I ride my bike, I like seeing people riding, too, and getting fresh air on me feels good. I also really like the smell of cut grass when I am out riding. I’m looking forward to riding my bike far, like on Marine Drive and Forest Park. Sometimes I ride with my niece at Columbia Park in my neighborhood. 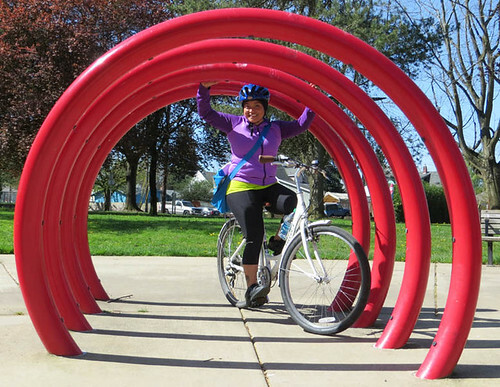 “Also, after I got my bike, I rode with kids in the Cully neighborhood. I work at Verde, and they had their first neighborhood bike ride. I was glad to have a bike so I could ride with them. Maria and I ride to Kenton Park in her neighborhood. During our ride, we discuss rules of the road, unexpected things to pay attention for, and how to ride so other people know what to expect of us as bicycle riders. Maria points to a shop on the right, “That’s where I got my bag.” While we’re at the park taking pictures, Maria’s niece shows up. “This is my niece who I go ride with. And this is her brother. And my sister.” We try to organize all of them for a picture. Every time we say “smile” her nephew sticks his lower lip out in a pout until we’re all laughing. Thank you, Maria, for sharing your story with us.